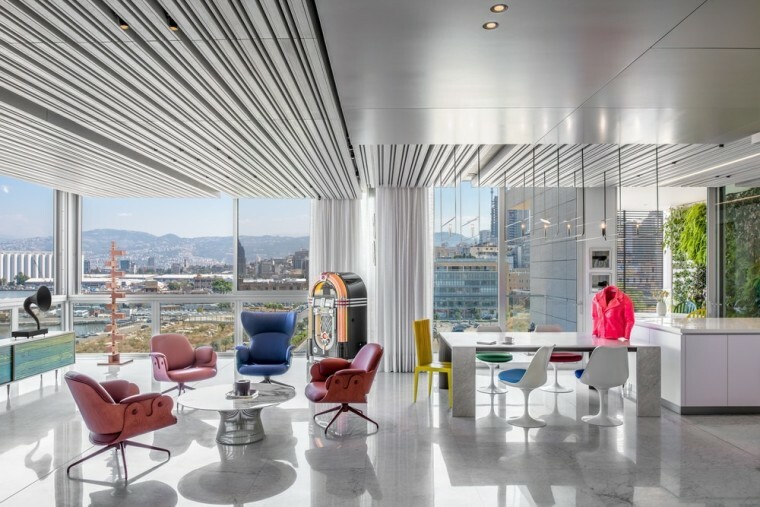 Beirut project exemplifies Askdeco’s ability to work outside of the box. The client adores a world of colours, cultures and textures, so the task at hand was to harmonise all of those influences within a single living space. 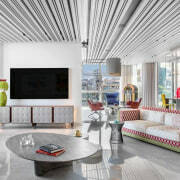 With a global portfolio of completed projects including luxurious homes, private yachts and commercial environments, Askdeco, a full-service design firm based in Lebanon, is proud to showcase its One Oak 5A2 residential project in the beating heart of downtown Beirut, a city home to world-renowned fashion designers, art galleries, performing arts venues and trendy bistros and cafés. One Oak 5A2 was a unique challenge, dictated by the multiple international influences embraced by the client. The owner, a well-travelled art collector who sells works of art and unique furniture pieces, wanted his new home to reflect that aspect of his life. Drawing inspiration from the colorful places he’s visited, his vision for One Oak 5A2 was a vibrant mix of worldly influences and décors. Working closely with the client on all aspects of design and materials selection, Askdeco was able to find the right mix of traditional Moroccan, Arabesque and Grecian patterns and textures to make the client feel at home. The client wanted to incorporate many different styles of furniture and accessories from different countries, which results in different themes and feels to each room. Askdeco prides itself in offering clients an unlimited range of design styles, enabling the firm to deliver optimal results for projects individually tailored to a client’s classical, contemporary or modern design preferences. 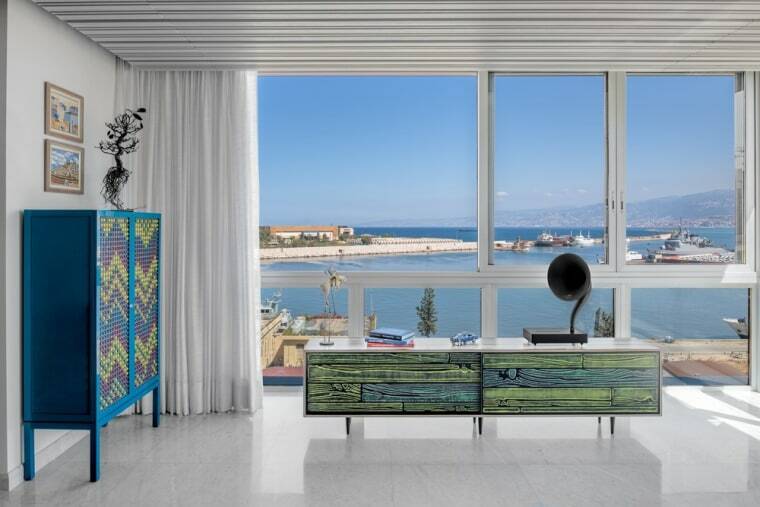 After working with the client to adjust tonalities and to devise a strategy for blending the space’s contrasts, Askdeco went to work on converting One Oak 5A2 into the quintessential bachelor pad, highlighted by 400m² of modern, yet eclectic design elements. 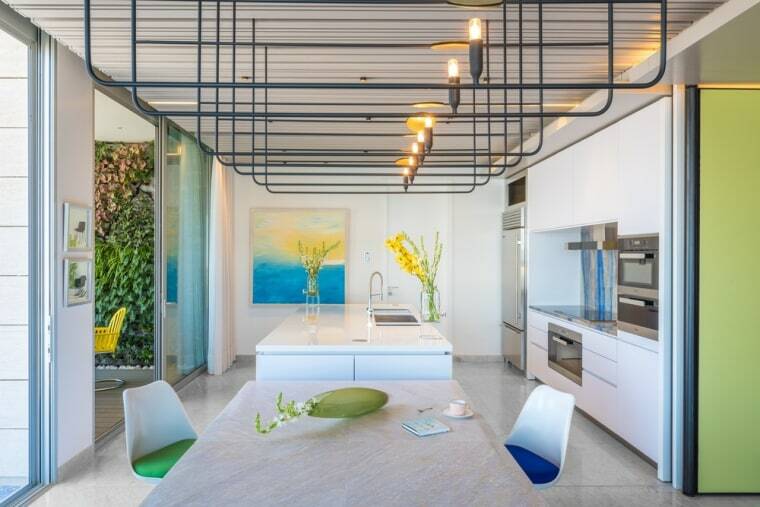 Muted white walls and Carrara marble flooring provide the ultimate canvass for allowing each colourful element to stand out on its own artistic merits. Askdeco’s philosophy and approach helped ensure that the final product bears the identity of the client. 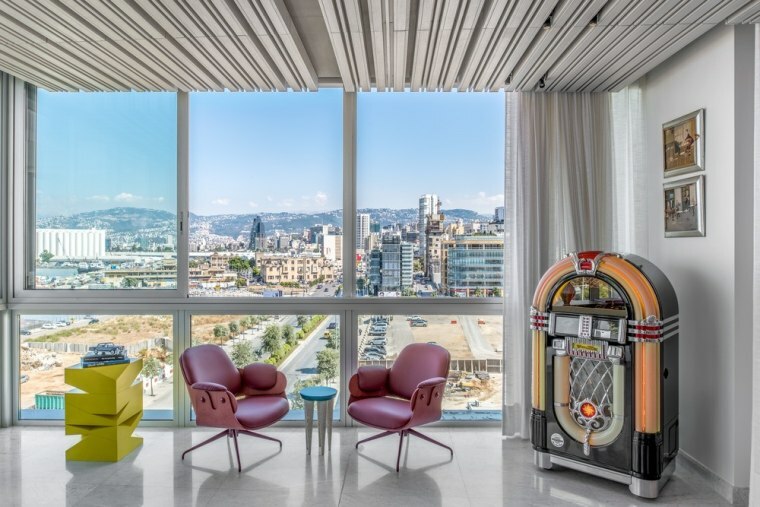 The beautifully designed space overlooks the Mediterranean Sea on one side, while views of Roman ruins and the downtown Beirut skyline await on the other. Between those breathtaking vistas, One Oak 5A2 is a vibrant and colorful space that oozes with life. 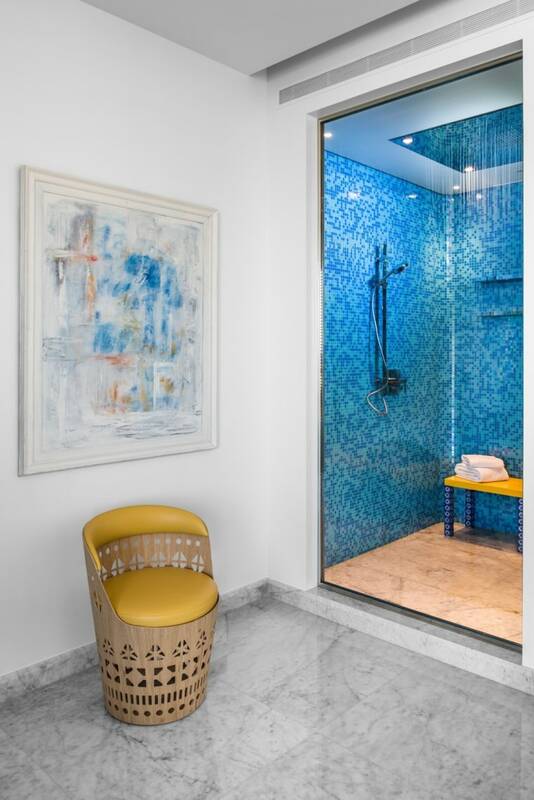 Muted white walls and Carrara marble flooring provide the ultimate canvass for allowing each colorful element to stand out on its own artistic merits. 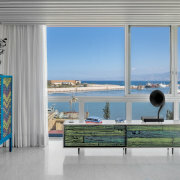 From paintings by Joan Miró, T.P.Hardisty and Hussein Madi, to Moroso sofas and Nada Debs cabinets, One Oak 5A2 brings color to life through Mediterranean stylings, avant-garde furniture and even pop culture elements that include a living room jukebox. Mediterranean blues and yellows accent the home’s white open kitchen, which connects to an adjacent dining area and lounge area that serves as a warm mingling space. 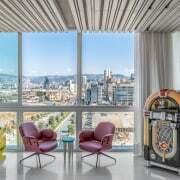 Mediterranean stylings, avant-garde furniture and even pop culture elements that include a living room jukebox. 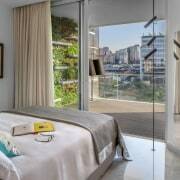 One Oak 5A2’s contemporary master bedroom opens out to a terrace overlooking the Sea, with floor-to-ceiling mirrored closet doors behind the room’s Cassini bedding to create the illusion of even greater space. A colorful Cortine Martin painting infuses color into the room’s contemporary décor. 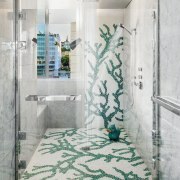 A Bisazza tiled shower pattern provides desired continuity between the high-rise unit’s internal and external spaces, as do its balconies, appointed with furnishings designed to mirror the unit’s interior. 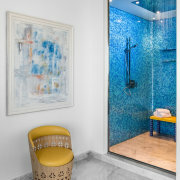 A Bisazza tiled shower pattern provides desired continuity between the high-rise unit’s internal and external spaces. 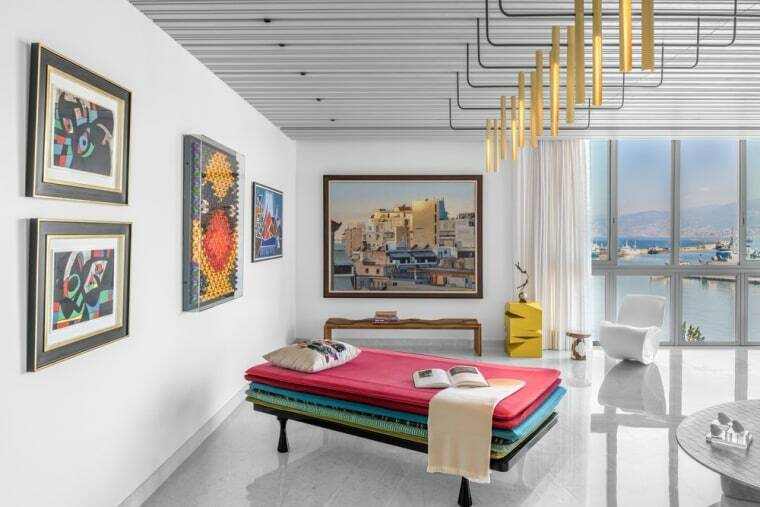 One Oak 5A2’s intricate ceiling serves as the pièce de résistance of the unit, with striped wooden panels that house the home’s custom designed lighting, sound system and mechanical controls. 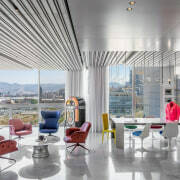 The client initially expressed distaste for existing architectural lighting with fixtures thought to be visual distractions and which lack decorative characteristics. 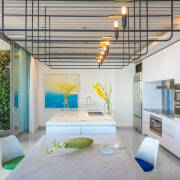 Responding to the client’s needs, Askdeco custom-designed One Oak 5A2’s lighting, which includes embedded PSLab spotlights that illuminate the home’s colorful interior décor and bring it to life.